This recipe features a distinctive spinach wrap in lieu of the more common wheat variety. If you prefer, you can easily use another type of wrap or even more traditional slices of bread. Regardless of what outer options you choose, the real magic of this recipe happens when you serve it with heated slices of chicken breast and warm bacon. Not only does the meat taste better warm, but it also helps melt the soft, shredded cheeses used in this recipe. For a super easy weeknight meal, pick up a rotisserie chicken and use the warm breast meat, or make a couple of extra chicken breasts earlier in the week to reheat later. If you are pressed for time, you can use your favourite prepared ranch dressing or you can make your own recipe from scratch. To assemble, place one wrap on a smooth surface and top with 2 Romaine lettuce leaves. 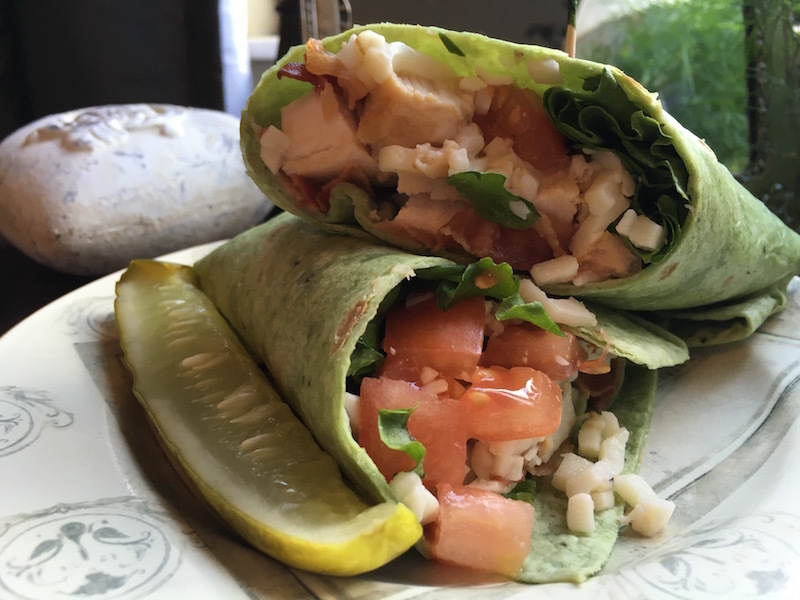 Add half the chicken, bacon, tomato and cheese on top of the lettuce, making sure to evenly distribute across the length of the wrap. Gently roll one side of the wrap over the assembled ingredients and continue rolling until you reach the other side. Cut rolled wrap in half and secure each side with a toothpick. Repeat with second wrap. Serve with a dill pickle and your favourite potato crisps.